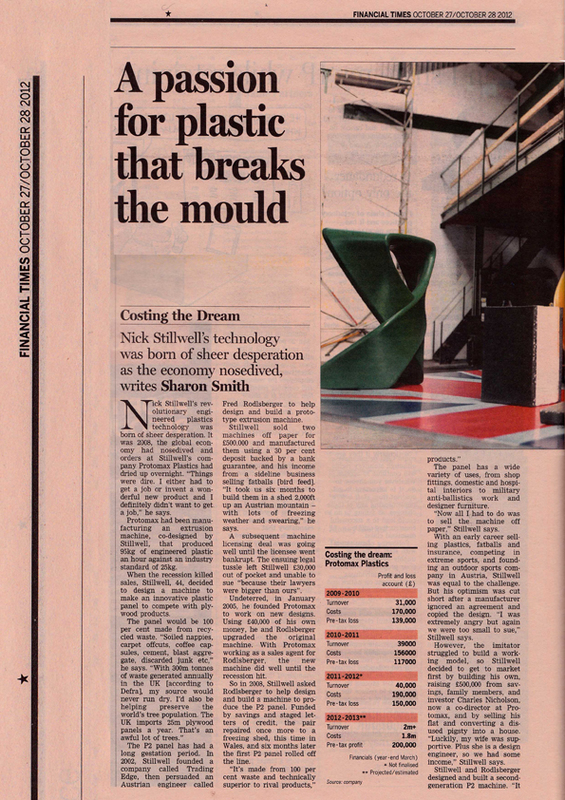 A passion for plastic that breaks the mould. Nick Stilwell’s business may well be prospering, but the road to success has not been easy. In theory, Nick Stilwell is the kind of entrepreneur that the European Union would like to encourage. He is an inventive engineer who has found ways to create building materials out of plastic waste. Instead of using trees and recycled wood to produce sheets of chipboard, he has devised processes and machinery that will make sheets of constmction board out of waste that would otherwise go to landfill or incineration. The EU would thoroughly approve of these green credentials. The EU might also recognise that Stilwell is instinctively European in his outlook. His wife‘s family is from Austria and it was through a partnership with an Austrian, Fred Rodlsberger, that he had his machinery built in Austria. The first fully-fledged factory that is using his equipment is in Poland - he does not own it. He is hoping that a second will be built in the UK. But when Stilwell reflects on his experience, he poses some serious challenges to the European Union‘s notions of how it should encourage entrepreneurship. The first is about the importance of intellectual property (IP). The EU has tied itself in knots over the course of more than ten years proclaiming the importance of a single European patent. Stilwell. scarred by experience, is sceptical. He ﬁled for patents and found himself hit by patent trolls - companies that challenged his patent applications as a means of extracting money from him. hoping that he would pay them off rather than take the dispute through the courts. He spent large sums of money fighting off these challenges to the novelty of his patents. He won, but is bitter about the cost of court litigation. Secondly, he stresses the importance of getting hold of finance. “We have to finance ourselves - through friends and family basically.” The banks do not lend. There is very little finance from public authorities. The company that set up a factory in Poland to use his machinery did get some public support. If he moved his operations in the United Kingdom to Wales. he might get some ﬁnance, but in England there is nothing. A third challenge is the shortage of design engineering talent. Stilwell is despairing about the skills available in the UK. Personal connections helped him to ﬁnd those skills in Austria. “We would not ﬁnd these people in the UK. We have tried,‘ he says. It is not hard to imagine Stilwell’s company prospering. He has turned a corner after being hit by the economic downtum in 2008, and returned to proﬁt last year. His machinery is making stuff that people want and it is using raw material that people do not want. “We never pay for material. There is so much waste that we will never catch up,‘ he says. On the other hand, whether or not this entrepreneur does prosper seems far beyond the inﬂuence of the EU. A Wingfield entrepreneur has come up with a proto-type for emergency shelters for refugees and victims of disasters such as ﬂoods and earthquakes. 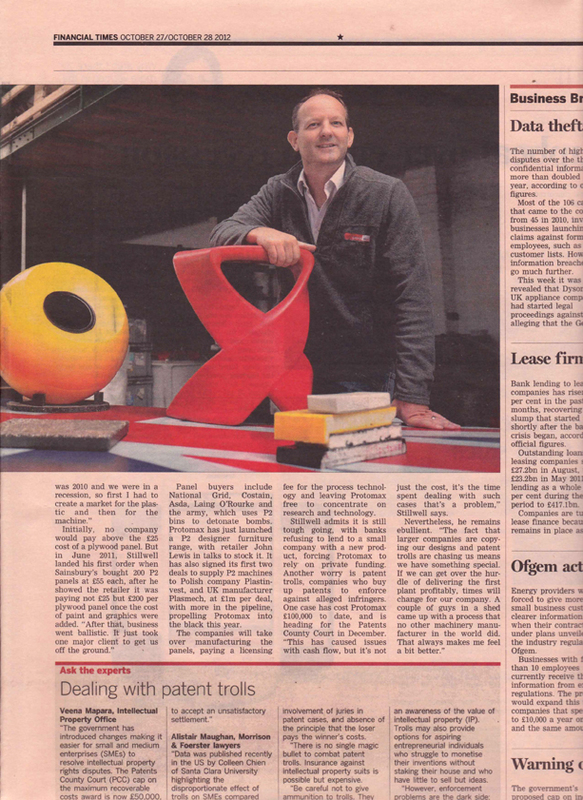 Nick Stillwell, who founded Protomax in Frome, has invented a 16ft by 12ft shelter made from recycled plastic panels. The shelter is seen as a semi-permanent solution to emergency housing by Mr Stillwell, who was helped in the design by ex-Royal Marine and architect Anthony Battersby who has experience of housing problems in under developed countries in Africa. The prototype is seen to be more sustainable to other a1ternatives such as tents as the materials are 100 per cent recyclable at the end of its use. The shelters, which would cost about £2,000, would have a life of at least 30 years. . “At the end of a shelter’s life it could be recycled and turned into other products,” Mr Stillwell said. 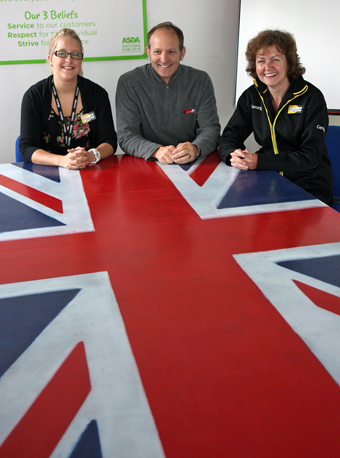 A Frome man has made Union Jack table tops which have been bought by Asda. One table is to be put in the supermarket’s Leeds headquarters meeting room and another will be based at Asda’s George clothing brand head ofﬁce in Lutterworth, Leicestershire. 'The patriotic table tops are the work of inventor and entrepreneur Nick Stillwell, who created them using recycled coat hangers supplied by the Frome store. Stephanie Knapton, the George manager in Frome, also asked Mr Stillwell to make one for its own training room. Between 500 and 600 coat hangers have gone into each of the ﬁrst two 8ft by 4ft table tops, each weighing 35kg. 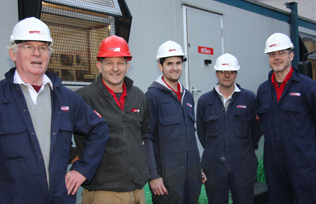 Mr Stillwell, who founded Protomax, a plastics engineering company based in Vallis Way and in Swansea, produces panels and other bespoke items using a mixture of recycled plastics, concrete, wood, blast aggregate and more. His machine, which turns mixed waste into usable everyday items, is the only one of its kind in the country. Mr Stillwell described his product as the new MDF —medium density ﬁbreboard — an engineered wood product used a building material in similar applications to plywood. He said: “But it is also suitable for inside and out as it does not rot, perish, warp or rust and is completely frost proof. 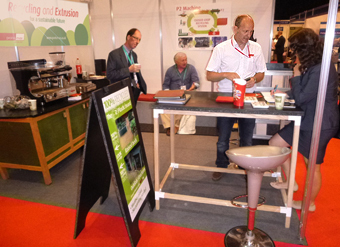 “It is durable, lightweight and low cost and the panels can even be recycled again after use. Panels can be painted any colour or colours without the need for repainting. Other products handled by Pretornax include. carpets, sweet wrappings, coffee machine foil cartons and leftover products from discarded airbags in cars,which are turned into items such as furniture, table tops, shower cubicles, cylinders, and protective use including letter bomb disposal containers and bulletproof cladding for armoured vehicles, and blood transportation boxes.